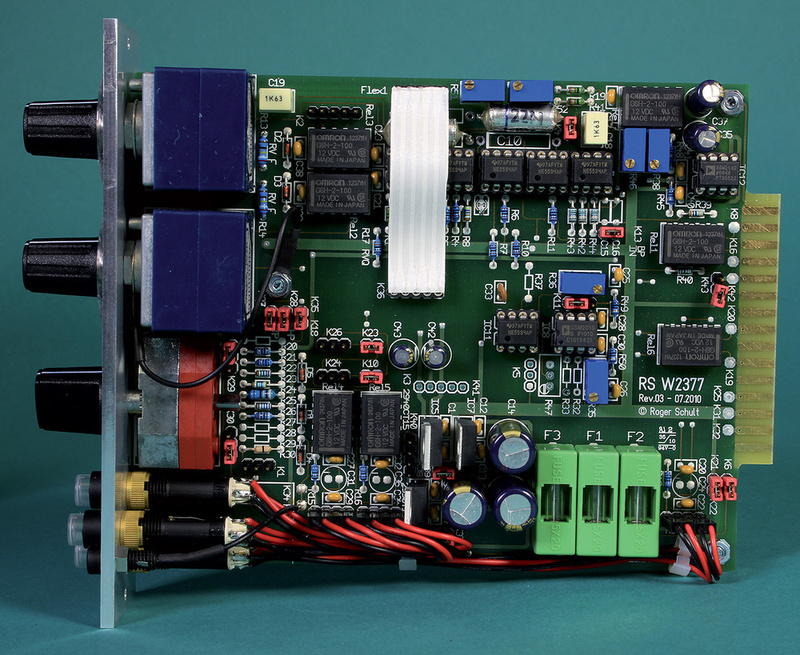 Employing a whopping three Lunchbox modules per channel, this EQ system may not come cheap — but it boasts some impressive features. 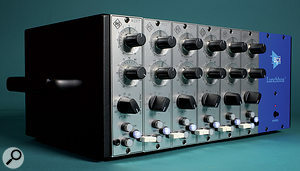 The API 500-series 'Lunchbox' format provides an ideal way to build up a collection of sonically interesting signal-processing devices without breaking the bank in one hit, and the variety of compatible modules now available from the entire world of pro-audio manufacturers is astonishing in its breadth and depth. Amongst the dozens of EQ modules currently available is a trio of parametric filter modules with some unusual features, designed by Roger Schult and intended for the professional mastering market. Modules are linked via a staple-like connector that fits into the front panels. 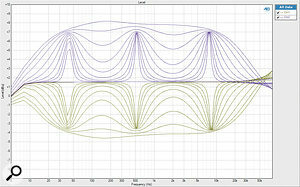 The RS Audio Technique W2377 filter modules, to give them their full title, are available in three versions: low-band, mid-band and high-band, covering the continuously variable frequency ranges from 20-730 Hz, 155Hz to 3.5kHz and 1.03-23.2 kHz, respectively. In all other ways the modules are identical, with the other major operational controls comprising a continuously variable ±10dB gain control (with a centre detent at unity), and an 11-step switched Bandwidth or Q control. These provide high- and low-pass filter modes at the extreme clockwise and counter-clockwise positions, and parametric filter Q ranging from 0.3 (almost four octaves) to 10 (0.15 octaves), in nine steps. 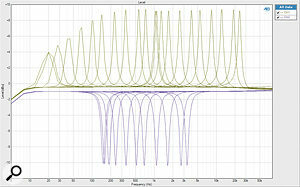 The frequency controls also work to determine the turnover point of the filters when selected to that mode. The continuous rotary controls are all ALPS potentiometers, while the rotary switches are from ELMA — all high-quality components that should provide a long and reliable service life. 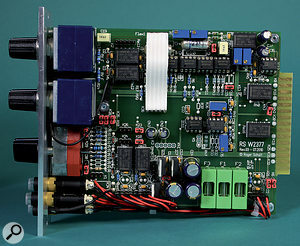 The modules appear to be neatly constructed.There are three illuminated push-buttons at the bottom of each module, the lowest providing a latching relay bypass function (the equaliser is in circuit when the button is lit). The others are a latching Solo mode, and a momentary Focus function. The Solo button works in conjunction with a set of removable links which plug into sockets on the outer edges of each front panel. Coupling adjacent modules together with these links their bypass relays so that pressing the Solo button on one module automatically bypasses all the other linked modules (multiple channels can also be soloed if required). This is a very handy feature for checking of the accuracy and effectiveness of the settings of one particular filter module without the distraction of any processing being applied elsewhere in the audio spectrum. The Focus function reverses the gain being applied in that module while the button is depressed. So if you have a notch filter with -6dB set, pressing the Focus button flips the gain momentarily to +6dB, enabling the tuning of that filter to be auditioned far more clearly. This is a remarkably useful facility that does what most people do naturally when adjusting EQ, but in a more convenient way. 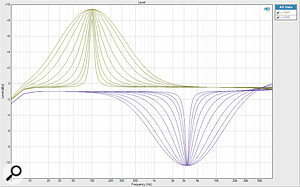 The array of high and low pass filter curves provided by the three separate filter sections (note: the gain discrepancy in one of the high-band modules was due to accidental misalignment of an internal I/O level trimmer.) The manual states that the nominal operating level set at the factory is +6dBu, although the input and output levels can be adjusted with trimmers on the printed circuit board if necessary. The maximum input and output levels are claimed to be +26dBu, although when tested using an Audio Precision system I found the modules clipped at just over +21dBu — but perhaps a previous user had adjusted the internal trimmers (there were a few minor gain anomalies indicating that some modules were slightly misaligned). With reference to the peak output level, the signal-to-noise ratio measured at a healthy 98dB and the THD+N figure was well below 0.01 percent at all operating levels, even with three modules chained together. 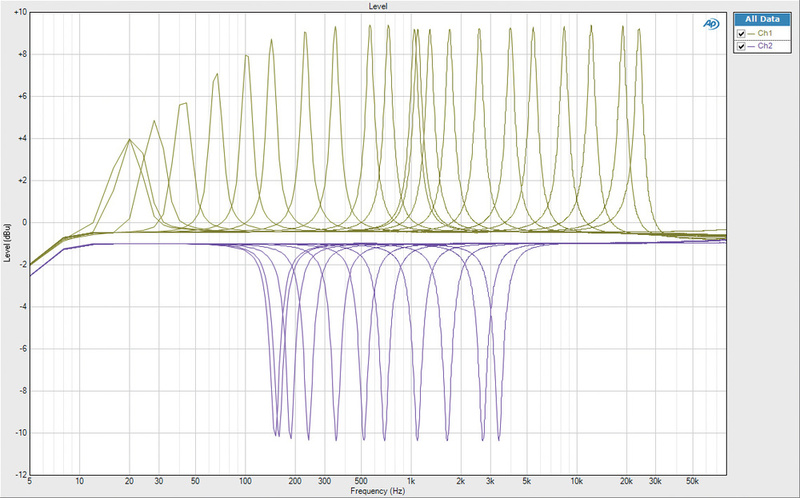 The frequency response with the controls at unity was ruler flat between 20Hz and well over 20kHz. By producing three individual parametric EQ modules with overlapping ranges, Schult has been able to set out the controls quite spaciously on the inherently cramped 500-series module front panel, which makes using them much easier than rather more densely-packed designs. However, the frequency bands provided on each module do rather cunningly force the purchase of all three, since no pair can quite cover the entire audio range! The range of centre frequencies available illustrating the band overlaps. The low-band and high-band sections are shown in full boost mode, while the mid-band is shown in cut mode. 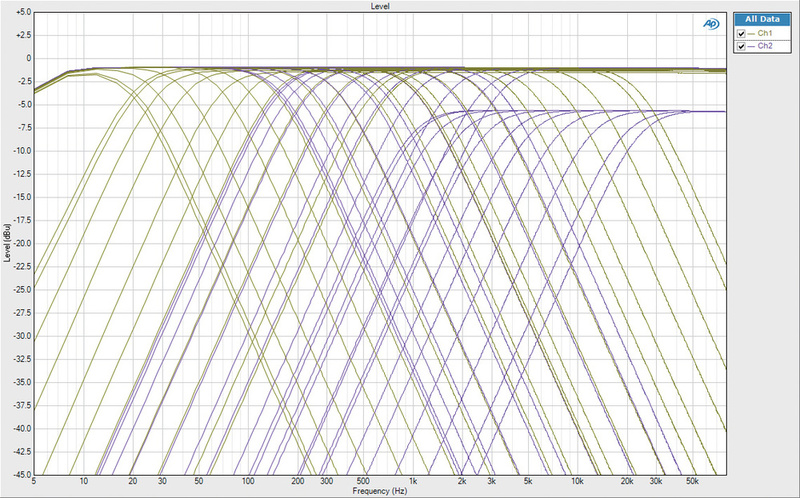 This plot reveals the slightly reduced amount of maximum boost available at the lowest frequency settings of the low-band module. 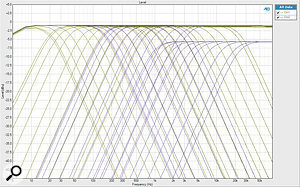 (note: the gain discrepancy in one of the high-band modules was due to accidental misalignment of an internal I/O level trimmer. )The W2377 modules work very well indeed and sound extremely clean and transparent, although it appears that the amount of bass boost is slightly restricted at the very lowest frequency settings, but this is not a bad thing in practice. In all other respects, the parametric equalisers work exactly as would be expected, and are capable of both gentle tonal shaping and quite surgical audio sculpting. 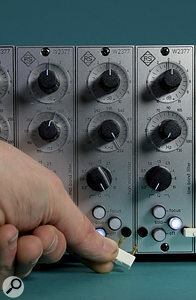 The three modules provide very generously overlapping frequency ranges, and allow two filters to be brought to bear on a troublesome region if necessary. 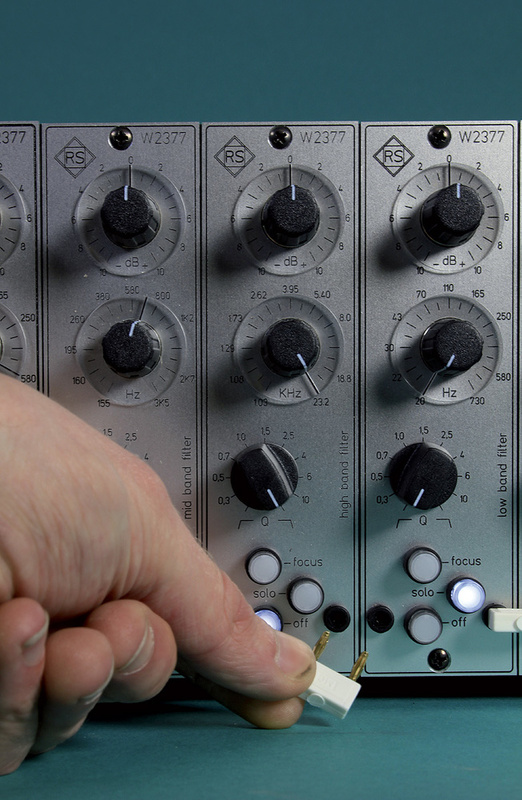 On a general-purpose studio tool the use of continuously adjustable gain and frequency controls is fine for most applications, but in a mastering tool switches are generally preferred, to allow precise repeatability and channel matching. I imagine suitable high-quality switches would have added to the cost and made the W2377 modules' pricing less attractive — but that must surely make these modules less relevant as mastering tools. 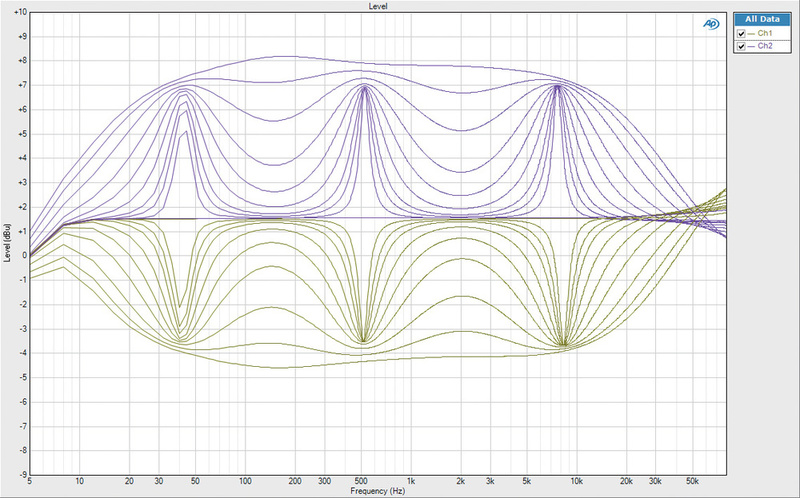 This shows how the interaction of the three modules affects the overall frequency response. The three modules were tuned to 43Hz, 580Hz and 8kHz, and the Q controls advanced from their minimum to maximum settings.The Focus and Solo switches are both very clever ideas that I've not seen elsewhere, and they make these modules a joy to use and configure. I tested the modules in a standard API lunchbox frame, with a full set of six modules to provide a stereo three-band equaliser. However, in this original frame there is no internal module linking, and so I had to use four short XLR tails to link the relevant modules together. Were I planning to invest in these units, I would probably investigate one of the third-party frame designs that includes adjacent channel linking — such as the Radial Workhorse, for example — simply to avoid unnecessary external wiring. 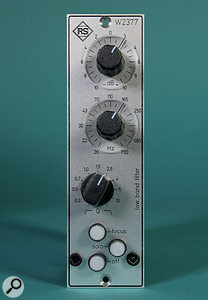 All in all, then, the W2377 is a nice modular equaliser with a good feature set. Its technical specifications are excellent, and the chosen frequency ranges and bandwidth settings are musically optimised. There are literally dozens of 500-series EQ modules, providing a variety of EQ designs and facilities, but most try to cram far more into the space than the Roger Schult designs, making them harder to use and usually less versatile — and none offer the very handy Focus and Solo linking functions. Very clean, transparent and open sound quality. Spacious front panels with easy control access. 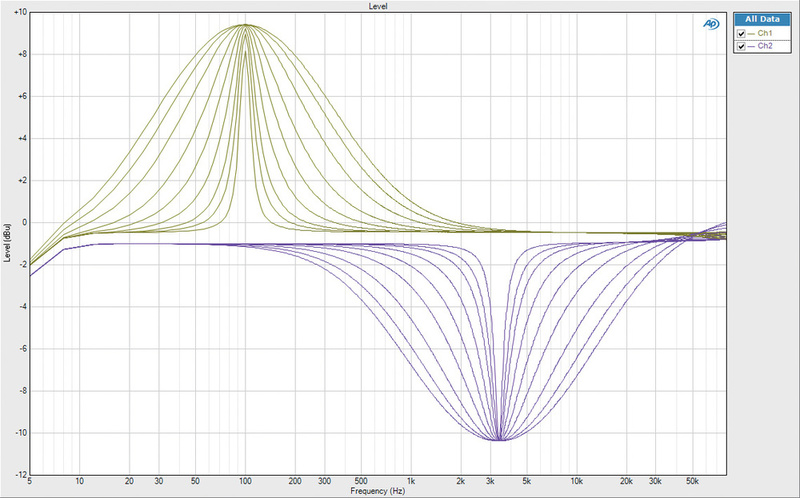 Well-chosen frequency ranges and bandwidth options. Clever module linking for the Solo function. External cabling needed between modules on most 'Lunchbox' frames. Three module spaces required per channel. This high-quality parametric equalising system is divided across three 500-series modules per channel. The Focus and Solo modes, to assist in finding and adjusting the EQ settings, are remarkably useful. 675 Euros per module including VAT. Mastering Works +49 2236 393731.